With that many people it will reduce the numbers of perch in the bay. Boy it has increased the number of pick ups in town. Third Creek yesterday, as posted on Iceshanty. I can't imagine what it was like at the point with the parking problems they have been having. 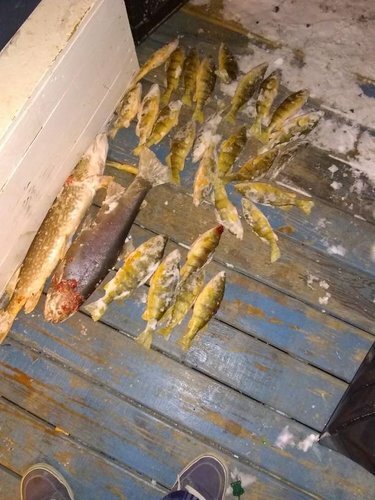 I've been hearing from one member here about "there is no such thing as overfishing", but the Sodus reports indicate that the bigger fish have likely been hit hard already, size has gone down in the reports and people are having to sort through lots of small ones to get a few over 9". Three weeks ago it was lots of > 12". I'm not convinced that it was 12"+, even at the beginning of the season...there's been an incredible # of 9-10" all year. I know a couple of guys who've done better, but not consistently and not in numbers. agree gator.. I got a couple of 11's today, they are huge when people says consistent 12's I don't believe it, unless I am there..
was not at Sodus either, the internet has killed what fishing is all a bout, I like the serenity, and scenery and getting a few fish.. I have been fishing for 55 years,, have not iced fished maybe in 5 years, went to sodus a lot.. could not even imagine the zoo..
you won't catch me there anytime soon if my limit would jump in the bucket.. have fun..
I’ve been thinking the same. Me and a buddy have fished the point a few times kept what we needed and have been catching and releasing since. Everybody thinks the perch fishing is amazing but after everybody pillages them it’ll be another 5-7 years until we have a good perch bite again. Irondequoit bay was similar a free years ago, it was mobb ed on the weekends had to get there early to get a parking spot. Then fishing dripped off for the last few years but it sounds like it's picking up lately which hopefully it won't get hammered again. That's right, I forgot about all fishermen being liars except you and me, and sometimes I'm not so sure about you!!!! If I had a nickel for every 2# perch I've heard caught in the bays of lake Ontario, I'd be rich. B.S. period. Their are guys that fish around this lake their whole life and never seen one. Seneca lake...... different story. Yep if I had a nickel for every one I caught, id still be broke!!! lol I catch some nice ones but there not 2 lbs. True dat! I will tell though you that I've been fishing it since the beginning, and haven't found 12"+ perch...it's been 9-10" keepers for a limit with a couple of bigger fish mixed in since first ice...so if I'm lying (and I usually am ), I'm lying upside down, if you know what I mean. Of course, I could just be a crappy fisherman (crappie??). I'm sure somebody got into some big ones, I'm less convinced with any regularity though. No doubt they're there though. I will also say that of the three limits I brought home, every single fish I cleaned was a female. I wonder what that means? Funny story--I was fishing Honeoye on Saturday and I'd kept three lakers for a friend from Keuka on Friday. As we were leaving I went to give him the bag of fish and two guys walking onto the ice said that it must have been good if we had a whole bag of fish. So I showed them the lakers. Their jaws dropped open. I guess they thought we'd caught them at Honeoye. Good stuff. I eventually--after milking it a bit--told them the truth. I go because of the mix bag I got the 2nd time up. Caught the pike then the rainbow while unhooking the pike. Was very exciting. This is more consistent with the theory that the huge year class this year is the hatch that did well due to the low alewife numbers after the winter of 2013-14, 9-10" fish. If the theory is correct, next year should be even better, and the survivors of the 9-10 fish this year should be 11-13". I will also say that of the three limits I brought home, every single fish I cleaned was a female. I wonder what that means? I guess they thought we'd caught them at Honeoye. Good stuff. I eventually--after milking it a bit--told them the truth. Glad to hear that, imagine the tip-up fields and additional jiggers you'd encounter once the word got out there! Seriously, I know there have been few browns caught out of Honeoye, but not enough to make them a conscious target. When I said "sometimes I'm not so sure about you", I was using the generic, not the specific. Your posts are always informative, and not bombastic. But there were guys posting about all the "hogs" they were getting. LOL. I got the "generic" reference. The way I figure it, if you can't laugh at yourself, it's time to have an attitude adjustment. And by that, I mean a beer . As for stepping in it, well, here's hoping our female compatriots have a broad sense of humor (OMG, no pun intended). Good luck with that. After doing solid perch fishing the past few years (like 40+), I have caught two perch over two lbs. One in Canandaigua four years ago that Gator ate, and one in I Bay this fall. So, Here is a nickel for you Scotty. Who has a "Broad " sense of humor? my lady and i brought home 34 on saturday with only 2 fish being over 11 inches. One was 12.5 the other just under 12inches. 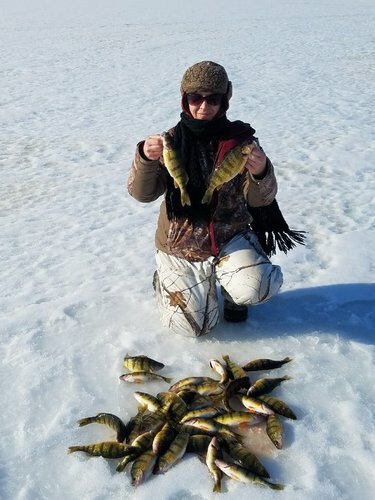 We have been the 3 times this year and hammered the perch everytime with 95 percent of them being in the 9 to 10 inch range. When i cleaned the fish i would say at least a quarter of them were males. The past 2 times we went they were all females that i cleaned. Even on Seneca a 2 lb perch has never been common regardless of what you might hear or see posted. 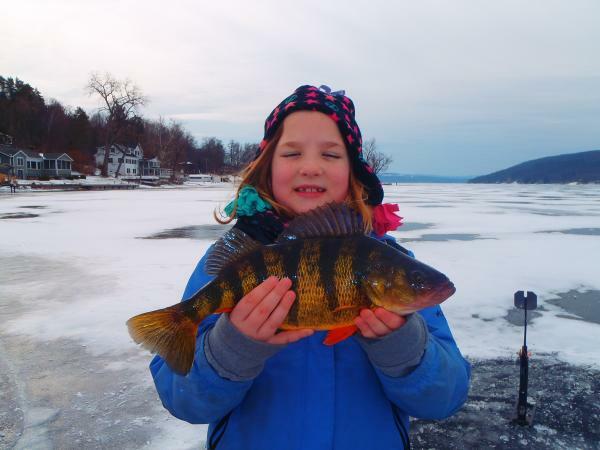 After over 60 years of fishing for them on many of the Finger Lakes as well as Sodus and Port Bay etc both ice fishing and from the boat and growing up fishing Seneca I've seen fewer than a half dozen caught. My own largest was caught while in high school (early sixties) from the long pier on Seneca while casting for trout with a small size daredevle and it measured 19 1/4 inches and looked like a football. It is one of the only fish I really regret not having mounted but never could have afforded it at the time anyway. We didn't even have a scale only a tape measure....Folks that have fished perch derbies have a real appreciation of what constitutes a 2 lb perch and they are very uncommon in any of these bodies of water. Wish I weighed that one!! Not saying what I thought it weighed but we got a few that day on Keuka. I fished Sodus this past Friday and I felt bad keeping some of the "10 inchers" I am seeing all these reports of. We kept a few but in no means did we keep our limits. All the people we saw out there was incredible, and if they are all keeping their limits of "10 inchers" it has to put a hurting on that system. Keuka can be great or a dud. The fixit4 you contest for perch this past spring had a 1st and 2nd place five fish weights of over 10 lbs. with a 2.51lb lunker. This past week, I could not get one over 6”. Biggest perch I ever caught was out of a canoe on Keuka back in the '80s fishing with my girlfriend from college. 3 lbs 4 oz. I've never even come close since then. My PB on Seneca for 5 fish was 8.11 lbs--which doesn't even hit the top five in the duck hunter's club tournament. Still, in terms of "meat fish" it used to be hard to beat Seneca if you knew where to find them. You could poke a couple dozen in the 12-13" range and they were beefy, with shoulders. Before folks learned about deeper water and big jig/minnow combinations, Irondequoit Bay used to produce a lot of the bigger ones. I went into a bait store one afternoon, and the owner was cleaning his catch, and had a 14" left to do. I commented on the size, and he said he kept the smallest for last. I would have called BS, but he showed me the heads from the others, his biggest was nearly 18".